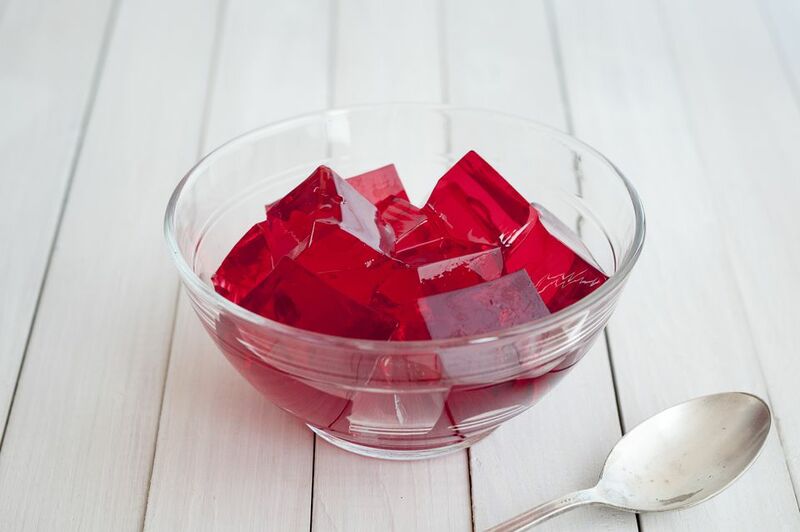 Whether you enjoy your gelatin in little cubes, as a liquor-filled Jello shot, or mixed into an elaborate congealed salad, Jello and other gelatin products can leave a big stain. It is not the gelatin that causes the problem, it's that added artificial coloring that can ruin fabrics. If some Jello hits your shirt, use a dull knife or spoon to lift away any solid pieces. Don't rub or wipe because that will push the stain deeper into the fabric and make it harder to remove. As soon as possible, flood the area with cold water by holding it under a faucet or sponging with plain water. Plain gelatin is a protein stain that can easily be removed by soaking or rubbing the stain in cold water before washing. Never use hot water with plain or dyed gelatin because it cooks the protein and can set the dye making the stain hard to remove. Sponge the stain with a bit of plain rubbing alcohol or non-sudsing household ammonia and rinse well. If the color is gone, wash as recommended on the care label using a good heavy-duty liquid laundry detergent (Tide or Persil are highly rated brands). These detergents contain enough enzymes to break down the stain. Less expensive brands may not work as well. If the stain was older or if any of the artificial color remains on the fabric, mix a solution of oxygen-based bleach (brand names are: OxiClean, Nellie's All Natural Oxygen Brightener, or OXO Brite) and tepid water following package directions and submerge the garment. Allow it to soak at least four hours or overnight and then launder as usual. This type of bleach is safe for natural and synthetic fabrics both white or colored. If the stain is not gone, repeat this step. When no stain remains, launder as usual. When that blob of Jello falls onto your clothes labeled as dry clean only, use a dull edge to lift away the solids. Remember, no rubbing! Dip a clean white paper towel or napkin in plain, cool water and blot the stained area. Then blot with a dry towel to absorb the moisture. As soon as possible, head to the dry cleaner and point out and identify the stain to your professional cleaner. If you are using a home dry cleaning kit for a small stain, be sure to treat the area with the provided stain remover before putting the garment in the dryer bag. Do not use the oxygen bleach/water soaking solution on wool, silk or anything trimmed with leather. When any type of Jello hits the carpet, move as quickly as possible to treat the stain. Begin by lifting the solids out of the fibers using a spoon or spatula. Next, mix one tablespoon of liquid hand dishwashing detergent, one-half cup distilled white vinegar and two cups of warm water. Use a clean white cloth, sponge, or soft bristled brush to blot the solution into the stained area. Work from the outside edges toward the center to prevent spreading the stain. Blot away the cleaning solution with a clean dry white cloth until no more color is transferred. Dip a clean white cloth into plain water to "rinse" the area. It is important to remove all the soapy residue because it can actually attract soil. If the stain is gone, allow the carpet to air dry away from direct heat. If the stain remains, mix a solution of oxygen bleach and cool water following the package directions. Use a soft bristle brush to work the oxygen bleach solution into the carpet. Allow working for at least one hour before blotting away and rinsing with cold water on a cloth. Repeat until all of the stain is gone. Allow the carpet to air dry and then vacuum to lift the carpet fibers. To remove Jello stains from furniture, use the same cleaning solutions and techniques as recommended for carpet. Be careful to not overwet the fabric because excess moisture can cause problems with the cushion filling. Allow the upholstery to air dry away from sunlight and direct heat. If the furniture fabric is silk or vintage, blot away the stain and then contact a professional upholstery cleaner or if you need more stain removal tips.